When we finally left the Al Berdaouni restaurant at half past midnight, our heads echoing with the rhythms of the tabla drums and our stomachs full of mezzeh and grilled meat, the place was just warming up – and this wasn’t even the weekend. We were reluctant to depart, but our leaving was made easier by our vow to soon return. If you pine for the nightclub scene of Beirut or Cairo but don’t feel like catching a plane and fighting traffic, then head straight for Al Berdaouni at the Regency InterContinental in Bahrain. The restaurant isn’t exactly in the hotel, but located in a separate building on the mezzanine level, by the swimming pool. This location, slightly removed from the hotel lobby, is a plus: it doesn’t feel like one of a half dozen ethnic eateries that often clot hotels in the Gulf region. Its identity is individualistic, rather than just another doorway in the hotel lobby. Walking across the pool deck beneath the night sky, Al Berdaouni glows like a Ramadan lantern, enticing you to enter a different world through its flamboyant doorway decorated in carved wood Arabesques of turquoise and red. There’s the slight whiff of a sheesha, or water pipe, upon entering, a tang of smoky-sweet apple and honey in the air. For fearful anti-smokers, rest assured: the ventilation is good and it takes hours before the sheesha smoke creates a haze in the air and by then, combined with the music, wine, grilled meats and mezzeh, it’s just another colorful thread in the exotic carpet that is Al Berdaouni. The interior is handsome and welcoming, with walls of faux cut stone, hanging lamps of Bahraini pottery, alabaster sconces, a gorgeous mosaic tile floor, and Oriental-school paintings of rug merchants and harem scenes. The lighting is subdued, with golden light from the sconces pooling in the shadows. The walls are lined with couches piled with ornate pillows and the chairs are big and comfy – Al Berdaouni is a restaurant designed for lingering meals, not for early diners or people in a hurry. The tables, set with cracked-glass candle lanterns, are arranged for optimal viewing of the stage floor, set on a slightly lower level. One side of the restaurant backs onto the Bahrain corniche where the scaffolding of the Bahrain Financial Harbor project, a web of pearly lights, rises into the sky. Al Berdaouni takes its name from the wooded gorge in the Sannine mountains of Lebanon, famous for mezzeh restaurants, established there over 100 years ago. This Bahraini take on the tradition lives up to the challenge, offering more than 50 delicious hot and cold mezzeh dishes. The task of deciding which mezzeh to order is simplified by sets of eight, 16, or 24 selections. The friendly and knowledgeable staff is also happy to make suggestions. There are two soups, lentil and the de jour choice tonight is minestrone. The grilled items are limited to the classics: lamb kofta; shish kebab; shish taouk; lamb chops; chicken; shrimp; mixed seafood; and a mixed brochette of kofta, shish taouk, and shish kebab. There is also a spicy variation on kofta, called korfaliyeh. The grilled dishes range from 3.6 Bahraini dinar (BD) to 7 BD. 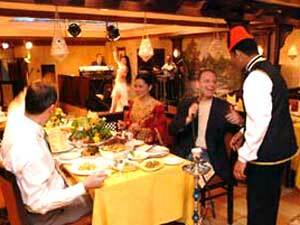 There are specials every day, such as Lebanese seafood, roasted baby stuffed chickens, hammor, or grouper, prepared several ways, and Turkish kebab. Diners are spoiled when it comes to the mezzeh. Cold mezzeh choices range from 1.1 to 2.2 BD, and include the usual suspects such as hommos, baba-ghanouj, kibbeh nayeh (lamb tartare), tabbouleh, fattouch, and stuffed vine leaves. There are some intriguing choices not always seen on menus, such as labneh lsanat (lamb tongue with lemon and garlic), nikhaat (lamb brain), moussaka, chankliche (cheese, tomato and onion), and marinated artichokes. Hot mezzeh, from 1.1 to 1.8 BD include kebbah, lamb, or cheese samboussak, grilled halloumi cheese, fateyer (spinach pie), rekakat (fried pastry with cheese), kellage (saj bread filled with halloumi and grilled), fuul madamas (fava beans with tomato, garlic, and oil), makanek (Lebanese sausage), sojok (spicy sausage), and arayees (Lebanese bread with lamb kofta). The restaurant does have a minimum charge for food per person to cover the entertainment, and varies by day of the week. The wine list is extensive and keeping true to the tradition of its name, offers 13 wines from Lebanon, spread between white, red, and rosé. There are bountiful selections from France, Italy, South Africa, Chile, Spain, Australia, Portugal, Argentina, and North America. There is a full bar, plus a wide assortment of fresh juices, including carrot, strawberry, kiwi, and melon. We start off with a glass of cloudy Lebanese arak and its aroma evokes instant memories of a long-ago trip to Kissab, Syria, where we sipped arak on a balcony overlooking rolling green hills spiked with cypress and dotted with olive groves and apple orchards. The arak was smooth and limbered up our palate for the feast to come. Our mezzeh order arrived soon after ordering and our waiter presented each dish with pride. The aromas rising from the dishes are divine: lemony, spicy, and roasted wood smoke. We also get a big basket brimming with hot pita bread. Later, our waiter brings us complimentary dishes of green and black olives and torshi: sour pickled cucumbers, cauliflower and carrots. The staff was attentive and accommodating and outfitted in classic black slacks, vests and white shirts. We discovered our waiter was from Shubra, a suburb of Cairo, and he was delighted to hear we had lived in Cairo for a time. We immediately established one of those warm connections so common in the Middle East and we settled in our cozy nook and set to work on the mezzeh. We ate hommos beyrouti, a version which mixed hot peppers, garlic, parsley, and lemon with the creamy hommos. The dish was peppery and slightly sour from the lemon, not your typical homogenous hommos. The moutabal was a real highlight: the eggplant smoky from the grill, garlicky but not overpowering. Our Lebanese shrimp salad was tender and sweet, with a dressing reminiscent of Russian. The loubieh, or green bean salad in tomatoes and olive oil, was the quintessence of the Mediterranean. Cheese samboossak was lightly fried and golden and filled with creamy, sharp-tasting cheese. The falafel was crunchy and crisp, not oily or greasy like it so often can be, and bursting with flavor. We had a bottle of red Montepulciano d’Abruzzo and its light, fruity taste went well with the myriad of herbs and spices in the food. Our waiter came around and asked us if we were ready for the main course. They don’t start cooking it until you are ready, a pleasant feature of the service that allows you to sit back and let the mezzeh settle until you are ready to move on. We have the mixed grill, three big skewers, one each of lamb kofta, shish taouk and kebab, with excellent fries on the side. We also have the kofta korfaliyeh and the slightly spicy and tender lamb patties are sandwiched between thick slices of eggplant, with roasted tomatoes and fries on the side. In another nice touch, the food is de-skewered, a relief to diners who struggle with sliding slippery hot meat off skewers. The tantalizing smell of grilled meat was a tonic for the senses. The shish taouk is zesty, juicy inside, and crisp outside. The kofta is parsley rich, tender, bursting with juice and absolutely delicious. The kebab, big chunks of lean lamb, is tender and smoky. The garlic dip is intensely sharp and brisk and, dabbed on the meats, makes us sit up and take notice. While we’ve been working our way through the food, the restaurant has filled to capacity. The entertainment gets started around 10:30, with a solo male singer playing a keyboard. He has a strong voice and the percussion rhythms from the keyboard have the audience swaying and clapping. 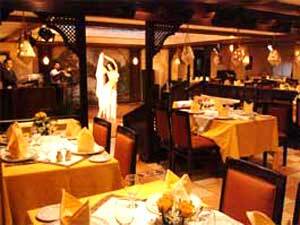 After a few songs, the belly dancer, a limber and energetic Brazilian with a smile that lights up the restaurant, performs a number of dances, accompanied by a tabla drummer. She is followed by a female Lebanese singer in a silver pants suit. She roams the room, easily persuading tables to join in the singing. The music, flashing lights and entertainers don’t detract from the dining experience, but add to it. The music is not too loud and not too flashy: Beirut light. The desserts include baklava, mouhalabiya (rose milk pudding), ice cream, fruit, and katayeff ashta (pancake with ashta cream). We order just the fruit plate, so stuffed are we from the mezzeh and grilled meats. The plate comes with generous pieces of pineapple, orange, melon, and red grapes. Unbidden, we receive a plate of various pastry so of course we have to try a few and they are terrific, nutty and flaky and honey-sweet. All that’s missing is an apple sheesha so one is brought around and the burble of the water pipe, the rich cups of coffee and the sound of the drums and an oud wrap us in a cloud of sheer delight.